December 5, in the Prairie Room of Illinois State University’s Bone Student Center. The series is free and open to the public. A panel of coalition members will reflect on their work to pass the “Keeping Families Secure Ordinance” in Bloomington and Normal. They secured the passing of an ordinance in Normal in May of 2017, but efforts failed in Bloomington. The panelists will reflect on the two years of struggle with both cities and future initiatives. 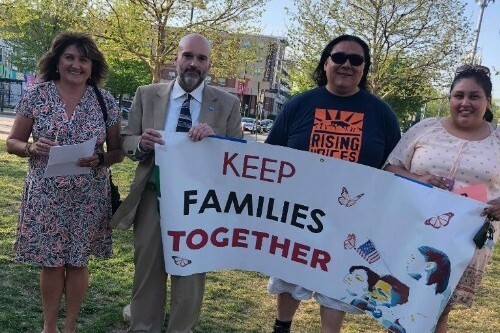 The panel will include: Executive Director of Illinois People’s Action Don Carlson; Sonny Garcia of Illinois People’s Action and Keeping Families Together Coalition; Executive Director of the Immigration Project Charlotte Alvarez; and Thomas Michael Cullen of Illinois People’s Action and Keeping Families Together Coalition. Illinois State’s Director of the Latin American and Latino/a Studies program Maura Toro-Morn will moderate. Speakers throughout the semester included Executive Director of Las Americas Immigrant Advocacy Center Linda Rivas from El Paso, Texas; Professor Gilberto Rosas of University of Illinois-Champaign, who has given expert testimony in deportation hearings; and, José Angel N., who read passages from his book, Illegal, about his experiences as an undocumented immigration. The International Seminar Series offers the Illinois State campus and Bloomington-Normal communities weekly opportunities to learn about a wide range of international topics. Guest speakers are usually experts in their fields across a range of disciplines who cover a wide array of cultural, historical, political, and social topics. Find our more at the Office of International Studies website.